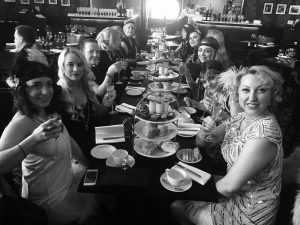 Our longest running partner vintage venue in Cheltenham, a firm favourite for vintage hen parties and birthday party outing ideas alike! 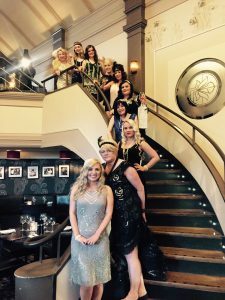 Have a Charleston Dance Dinner or a Swing Dance Afternoon Tea with this award winning art deco cinema conversion in Cheltenham – it’s a gem of a fine dining restaurant. Work up an appetite with a 1920s Charleston Class, or a 1930s Swing Era Dance Class at a hall close to the restaurant, then go on for afternoon tea or dinner. Then sit down for Champagne Afternoon Tea or a three course dinner in one of the most beautiful Art Deco cinema converstions that we’ve ever seen. Enjoy the original art deco features such as the Daffodil engraved mirrors, sweeping staircase and daffodil mosaics in the beautiful art deco cinema conversion. Ask us about your preferred date and we’ll organise the dance class and make the restaurant reservation for you. Combine this with the 1920s Day Out Cheltenham for a complete day out. 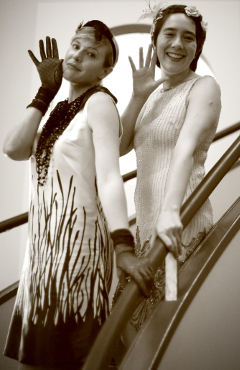 This venue is also great for 1940s hen parties and 1950s too! 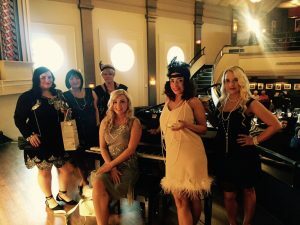 This vintage experience can accommodate large groups, please ask!